This is very cool, the first of its kind! A waterproof diffuser for your shower! The Shower Diffuser™ Essential Oil Aromatizer™ is bringing the benefits of aromatherapy to your bathroom in a way that has never been seen before. It’s the world’s first waterproof wall mounted essential oil diffuser. 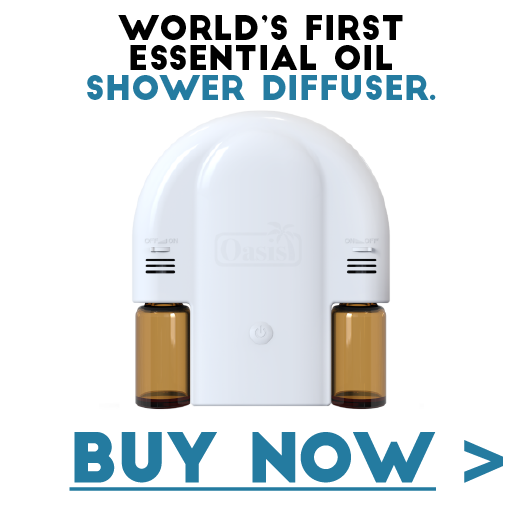 With this new invention you can diffuse essential oils in the shower! Easy to mount and works with essential oil bottles from all major essential oil brands! Shower time can be a therapeutic experience, the Shower Diffuser™ by Oasis can make that experience even better! Compatible with bottles from all major brands. Fits 5ml, 10ml and 15ml bottles. Holds 2 bottles simultaneously. Diffuse one bottle or both at the same time. Includes Wall Dock™ that sticks to almost any surface and removes cleanly. Uses 3 AA Batteries. Shuts off automatically after 8 minutes. As I was reading customer comments about the Shower Diffuser™ I noticed an exceptionally high number of customers that were extremely happy with this product. A very small number of people said that the scent coming out of this diffuser was not very strong. This could be due to the brand and quality of the specific essential oils being dispersed. I would always recommend using high quality oils from a trusted brand when diffusing oils in any diffuser. With the Shower Diffuser™ you can have a spa in your own home! Your shower acts as a humidifier creating the perfect environment to diffuse essential oils. This means you will be gaining all the mental and physical benefits of aromatherapy right in your shower! This is fantastic! With the variety of available oils and the numerous benefits they provide, adding this product to your daily routine will benefit you in a ton of ways. Diffuse peppermint or lemon in the morning to help wake up. Diffuse eucalyptus during the cold and flu season to boost your immune system. Enjoy the scent of lavender to relax before bed. Relax in the tub and take in the scent of Jasmine to settle your mind. The possibilities are endless! If you are currently using bath bombs or dripping essential oils into your bathtub then the Shower Diffuser™ is a great choice for you. It’s easy to mount and ready to use within minutes. This unit will create a mist for you to enjoy while you shower. Sweet! No more bath bomb messes or slippery tubs! Since the Shower Diffuser™ fits bottles from all major brands (such as Young Living, DoTerra, NuSkin, Melaleuca, Plant Therapy, and others) you don’t need to purchase special bottles. You may already have some of these brands in your existing oil collection. I really like that you can blend two oils at the same time or just use one. It might be handy to have a morning oil and an evening oil available and ready to go. No need to switch out the bottles. Another awesome feature is the auto shut-off (after 8 minutes). This is a great thing, however I can see turning it back on and taking a longer shower sometimes. LOL Having the auto shut-off means you don’t need to worry about the battery running low or wasting your essential oils. I think this little diffuser would make a perfect gift for almost anyone. Great for any occasion! Who wouldn’t want the spa experience in the comfort of their own home? Essential oils have been used for thousands of years for a variety of purposes. I use them regularly to boost my immunity and for my physical and mental health. 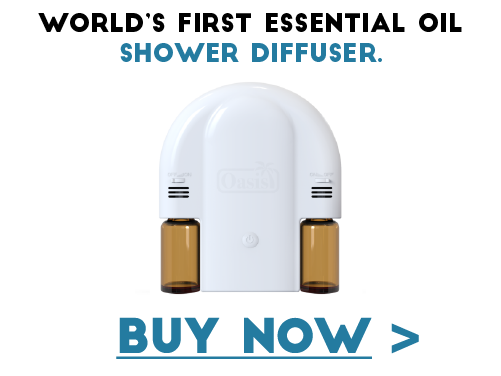 I am so excited about the Shower Diffuser™ by Oasis, what a fantastic little device. This will change the way we think about taking a shower! I love that you can use two different oils together or separately. Great product! I bought one for my sister, she loves it too! Perfection! Simple and easy to use. It’s quick and easy to change out the oils when I want a different scent. I just received it. I’m really looking forward to putting it to use. I love the fact that it comes with a good warranty. I love my new wall mounted diffuser! My son has trouble falling asleep. Now he takes a shower with Lavender before bed. If you have a cold, it’s great to take a shower with eucalyptus essential oil. I love it! I use the Shower Diffuser every day. I use peppermint essential oil to wake me up in the morning. This is the BEST invention ever! I am excited to have an easy way to use my essential oils in the shower. I love the automatic shut-off feature as it saves on the batteries and my essential oils are not wasted. I give it 5 stars! I love it so much! I highly recommend this diffuser to anyone that enjoys diffusing essential oils. I hope this review has been helpful. I was excited when I discovered this new kind of diffuser for the bathroom and I just had to share. I would love to hear from you if you have any comments about the Shower Diffuser™ by Oasis. Have a fantastic day! Stay happy and healthy! Essential oils are very POTENT and should be used with common sense and caution. Always read the labels. If you are currently taking any prescribed medication speak to your doctor before using essential oils. If you are concerned about allergies, you may want to perform a patch test on your skin. Some essential oils are photo toxic. Avoid the sun as necessary when using these oils. Some oils are not recommended if you are pregnant or nursing. Essential oils are considered “complementary and alternative medicines” and are not a substitute for professional medical intervention and advice. If you are experiencing severe physical or mental illness contact a medical professional. I could not imagine life without my essential oils either. I think the Shower Diffuser is a great invention. I love that you can attach two different bottles and choose to use them together or individually. This would make a fantastic Mother’s Day gift! Thanks for popping by. I hope you have great day! Wow what a great idea! I use essential oils in my bath and in the shower I block the drain with a washcloth that has a few drops of essential oils soaked in to it. This weird system works OK, however, this shower diffuser is a much better idea. I love that it has two bottles so you can choose what type of aromatherapy you need. I love rosemary in the morning and something relaxing like petitgrain or chamomile at night. Great idea and review. I sure think this new Shower Diffuser is a great alternative to dripping oils in the tub or using bath bombs. Thanks for sharing what oils you use at different times of the day. I am a huge fan of using oils for my overall health, I truly believe they can help us in many ways! Thanks for stopping in and sharing your ideas! I hope you have a fantastic day! My wife and I are expecting our first child. With this my wife has been sick a couple times with a head cold and could not take any medicine. We started using the diffuser that we got for Christmas and it has helped her quite a bit. She also would sit in our bathroom with the hot water on and use the steam to help clear her congestion. I will pass this onto her as this shower diffuser would be the best of both worlds. I wish both you and your wife all good things with the upcoming birth of your new child! How exciting! I know what you mean about being very limited with medications while pregnant. One needs to be very careful. I wanted to say, but you probably already know that some essential oils are not recommended when pregnant. That being said, I think with the right oils your wife might really like using this new invention to fight congestion when she is not feeling well. I sure appreciate that you stopped by. Again, best wishes to you, your wife and the little one! What a great idea! I will be looking to buy on of these. Thank you for this lovely idea. Yes, this is such an awesome invention. Now we can enjoy misting essential oils in the bathroom. I think the Shower Diffuser by Oasis is going to be a hit! Thanks for stopping by! I love to spray essential oils into the air in my bathroom before I shower. This is so much better. Having the option of two different scents is definitely a great idea. I’m not really a bath person so I usually use my essential oils as air fresheners in the bathroom. Peppermint oil would be great first thing in the morning. I usually like to start my morning with rolling a tiny bit on my temples. I find it wakes me up. With the Oasis shower diffuser I might be able to skip this step. The less I have to do to get ready in the morning the better. The shut off timer would be very handy for me too. I tend to forget to turn things off – or think I have and then worry all day about it. Thanks for sharing this new invention. I’m thinking the Shower Diffuser Essential Oil Aromatizer is one cool item that should go on my wish list for Mother’s Day. I think the Shower Diffuser by Oasis is a fantastic thing. I like that it fits most common essential oil bottle sizes too. So, it would probably fit any oils we already have in our collection. I often worry about forgetting to turn off certain things in my house too, so the eight minute shut off feature is awesome. This would make an really good gift for almost any occasion, especially Mother’s Day!